It makes me a little crazy that every time the markets go up or down the newspapers cannot resist attributing a reason (though they’re not so good at predicting!). Today’s NY Tim es: “Markets down 2% on concerns about slowing economy.” Oh Yeah? How do they know that’s the reason? Maybe it is the cost of oil, the situation in the middle east, unemployment, gamma waves… So I decided to try an experiment: let’s predict up or down randomly, and give reasons, and we’ll see how well we do. Now, I believe in modeling that ADHD and other such things are nothing to be ashamed of. Simple brain chemistry; doesn’t make you a bad person. But what many folks don’t realize is that ADHD involves hyper-focus as much as inattention, and so setting off to build a simple random number generator… well the truth is I already have one. But what a great opportunity to build a Win Phone Application. So, I got this working in 20 minutes. And then tinkered for a few hours. 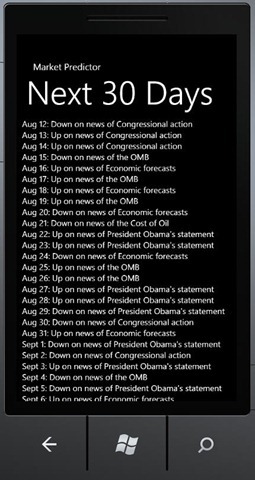 The application itself is pretty simple, just a single page that displays a scrollable list of 30 days worth of randomly generated predictions. Let’s take a quick look at the code. For this quick and dirty application I did not use MVVM (sometimes you just don’t! ), and all the code is in MainPage.xaml.cs. The public property DateAndPrediction returns a string that will be displayed in the list box, and it is to this property that the TextBlock in the DataTemplate binds. Set the data context to the collection of predictions defined as a member variable of the class. All the fun happens in SetData. We’ll create an array to compute the number of days in each month and a Dictionary for the month names. With those ready, we can compute the current date and then create predictions for the next ten days. This entry was posted in Mini-Tutorial, News, WindowsPhone and tagged WindowsPhone, wp7Tutorial. Bookmark the permalink. But as a society there is a gap between what we say about mental illness and what we really feel. My boss talks about his diabetes. I doubt he takes much of a career risk doing so. Talking about my ADHD is different, and raises all those familiar questions “why do you need to talk about this; isn’t it private?” yadda yadda. That’s all code for, there’s nothing *wrong* with it, we don’t really think it is a moral failing, but it isn’t quite okay either. Too broad a statement, but true for an awful lot of folks i meet. Your tutorials are really great, love the focus on silverlight. With your help my company and I where able to deliver our medical systems built with Silverlight 3/4 with ease. Also I think it’s great that you understand ADHD there are so many people in this world that only think of it as a disability but fail to see the enabling side. When I hyper focus I can work for long stretches 3 – 5 producing both quality and volume that non ADHD brains often have a hard time keeping up with. Having ADHD also makes you a wiz in whiteboard / brainstorm sessions. Thanks again for all your great tutorials and code samples it’s people like you that make working in the Microsoft community of developers so fun.